Try this fruity, colorful Orange Easter Cake when spring rolls around. Sugar cookies, vanilla pudding and orange JELL-O come together to make this refreshing molded Easter cake. Add boiling water to gelatin mix in large bowl; stir 2 min. until completely dissolved. Stir in cold water; pour 1-1/2 cups into 9-inch round pan sprayed with cooking spray. Refrigerate 2 hours or until gelatin is set but not firm. Stir milk into remaining gelatin until blended. Add dry pudding mix; beat with whisk 2 min. Stir in oranges and 2 cups COOL WHIP; spoon over gelatin layer in pan. Top with layer of cookies. (Pan will be full.) Cover. Refrigerate 4 hours or until gelatin is firm. Run knife around edge of pan to loosen dessert; unmold onto plate. Garnish with remaining COOL WHIP. At 10 servings, this is the perfect dessert to serve your guests at your next Easter gathering. Prepare using 2 pkg. (3 oz. 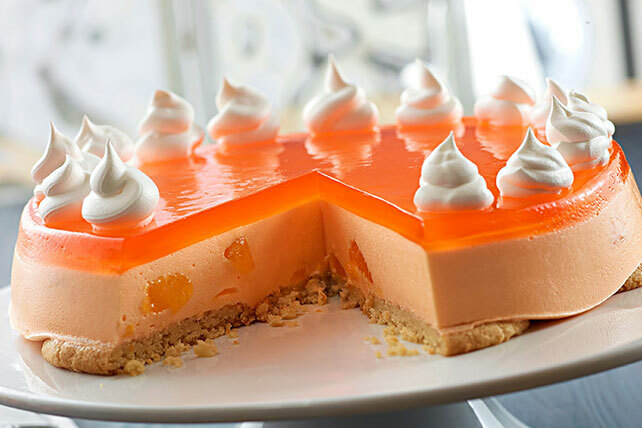 each) JELL-O Orange Flavor Gelatin. Place unopened tub of COOL WHIP in the refrigerator. For complete thawing, allow these times: 4 hours for 8-oz. tub, 5 hours for 12-oz. tub, 6 hours for 16-oz. tub. Do not thaw COOL WHIP in the microwave. Run knife around edge of pan. Dip pan in warm water, just to rim, for about 10 sec. Place serving plate on top of pan. Invert; holding pan and plate together, shake gently to loosen. Carefully remove pan.